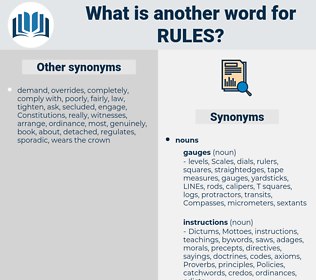 What is another word for rules? instructions, implementation, matters, prohibition, orders, reglamentos, purposes, instruments, decisions, systems, issues, courts, practices, elements, directions, tribunals, refuses, obligations, REGS, solutions, mechanisms, force, committee, angels, rejects, benefits, please, IFRS, ways, directors, text, texts, plans, article, articles, nations, schemes, products, Rights, options, tools, claims, IAS, types, Roles, Measures, Its, methods, acts, Cells, approaches, modalities, IPSAS, basis. 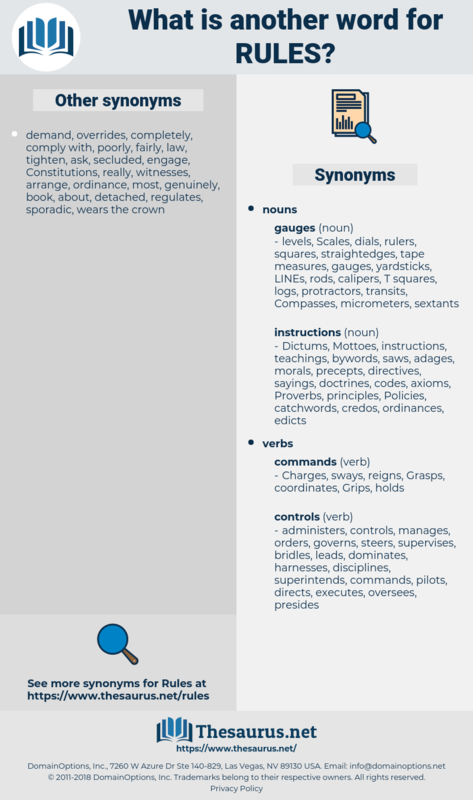 govern, article, articles, Stipulated, stipulate, legislations, regulating, republic, fundamentals, regulated, Roles, procedural, Measures, prescribed, Delivered, required, statutory, literature, enforcement, standardization, instrument, discipline, disciplines, Requiring, formalities, NORMES, declare, particulars, settled, mandatory, settles, organisation, Addressing, practice, mandated, merchandise, require, executive, Providing, observe, Provided, pursuant, proceeding, MMER, europe, tribunal, relevant, solution, treatment, decides, define, european, framework, TTBER, association, method, methods, ITR, related, acts, parts, council, provide, Fraser, compliant, manner, steps, Cells, redress, consistent, equipment, IMIS, PRNG, adjustment, de, approaches, industry, CBCR, content, ppvcr, NSNR, MMAR, PCR, how, CTMR, ADR, play, MVSR, IPSAS, CMR, MFR, MDR, fdr, field, payment, income, ATR, mode, gross, speed, staff, new, claim, C, way, legislation, regulate, canada, resolve. instructions, L, authorities, administrative, Classifications, governs, Guarantees, agreements, matters, underpinnings, establishes, decrees, characteristics, prohibition, prohibitions, understandings, orders, regulamentos, values, restrictions, Irregularities, purposes, Advertisements, Languages, represents, Recommendations, instruments, specific, decisions, considerations, representatives, determines, launchers, excludes, stipulations, Measurements, examples, services, systems, Prescriptions, judges, concludes, derogations, parliament, links, precepts, benchmarks, authority, regular, issues, definitions, considers, organisations, customs, subsections, governors, chapters, professionals, doctrines, charters, certificates, practices, imperatives, applies, Expenditures, reserves, report, reports, mechanics, strictures, resolves, commitments, Penalties, enterprises, table, Addresses, elements, Records, directions, numbers, stakeholders, protocols, planned, reservations, mores, violations, strict, times, safeguards, obligations, conventions, distributors, initiatives, Resources, parameters, series, REGS, Negotiations, players, institutions, document, documents, borders, installations, arms, exemptions, enactments, indications, contributions, interests, solutions, situations, channels, commandments, mechanisms, losses, consumers, objectives, believes, force, forces, proposals, constraints, producers, workings, routes, Incentives, platforms, queen, questions, law-making, teachings, sanctions, targets, ethics, effects, frameworks, modifications, others, grounds, levels, checks, challenges, statues, solving, mandates, spirits, menses, Achievements, Entities, goalposts, Salaries, devices, assets, models, patterns, notions, subjects, benefits, positions, applications, supplies, instances, Efforts, rankings, Duties, commands, Commodities, police, limits, dividends, bans, notes, Adjustments, organs, employees, requests, Databases, offences, Immunities, taylor, components, IFRS, lists, deposits, Foundations, ways, directors, officers, _, Ones, costs, demands, warrants, text, texts, markets, Diets, plans, Countries, citizens, article, articles, spanish, Parties, schemes, Goals, Testimonies, things, FORMATS, points, functions, Agencies, expenses, aids, awards, tenets, Crimes, products, Rights, bills, Missions, options, tools, actors, Facilities, payments, modes, exchanges, agents, banks, aspects, speeds, funds, annex, sets, CAMPS, constants, changes, margins, Shots, Forms, nets, cases, claims, VOTES, legislations, 2007, signs, actions, canons, regulating, motion, IAS, 1997, 2003, fundamentals, regulated, Guns, finds, 2004, bonds, Bodies, types, Roles, Measures, 170, 139, 28, women, disciplines, formalities, NORMES, meetings, particulars, 21, LINEs, decides, framework, methods, acts, parts, steps, Cells, approaches, modalities, IPSAS, speed, C, statuses. dictates, statue, solving, playing, corpus, rag, legislation. violated, Followed, Was, noted, settled. existing, according, article, articles, regulating. calculated, described, advised, Followed, prepared, laid, permitted, contained, missed, based, regulated. principles, regulates, exists, prevails, delivers, understands, runs, regimes, dominates, directs, imposes, reglas, prescribes, requires, prohibits, Guidelines, Exercises, matters, specifies, establishes, defines, regards, provides, solves, command, leads, condemns, sends, determines, excludes, deals, concludes, works, plan, issues, considers, speaks, topics, applies, reports, resolves, Addresses, refuses, allows, heads, reads, fails, dark, mandates, rejects, subjects, benefits, limits, Comes, pays, plans, article, articles, awards, sets, Does, stipulate, makes, regulating, finds, Measures, NORMES, settles, regulators, pursuant, decides, framework, acts, manner, steps, approaches. participate, start, wrap, JUS, face, article, articles, regulate, settle. regimes, Guidelines, directives, stipulations, injunctions, states, rulers, bylaws. rulebook, rulemaking, applicable, determination, ruler, rulers, regulator, regulators, bylaws, modality, modalities, basis, section. rulings, regimes, Guidelines, directives, judgements, verdicts, organization, Organizations, Criteria, injunctions, politics, applicable, states, regulators, bylaws. rule-making, menstruation, etiquette, rulebook, purview, Playbook, scaling. guideline, governs, decisions, applicable, states, modalities, section. That chance is over now, and according to all rules that ever I heard of in such matters, you ought to surrender. Now, we won't have any rules, except that this is to be a straight fight. rural, roily, roil, riley, rale, reel, rarely, real, riel, raw wool, rollo, riyal, rile, royally, rail, royal, ruly, rill, roll, railway, rely, rial, rowel, reheel, rally, rouleau, role, relay, raoulia, really.